Egg less homemade orange cake recipe from scratch which helps you bake an easy delicious orange cake from scratch without using eggs. The egg free orange cake recipe using fresh orange juice is full of flavor with a bright and colorful hint of natural orange color from the freshly squeezed orange juice used. If you are just looking to prepare an easy and delicious cake without eggs, this is it. This is one of the best and easy egg less cake recipes which uses fresh orange juice and sweetened condensed milk like milkmaid or use whichever sweetened condensed milk you have with you. I am very excited about this cake since it is very easy to prepare and it has turned out really amazing that we didn’t get enough of it. The cake has got light brown spots on top even though it didn’t affect the taste. You can prevent this by using an aluminium foil to cover the cake, once the top of the cake starts to turn brown. The recipe I am sharing here uses fresh orange juice as well as little lemon juice, so it is the citrus juices that do the work here instead of eggs. I didn’t use orange essence or any artificial flavors, the cake is naturally flavored from pure freshly squeezed orange juice. 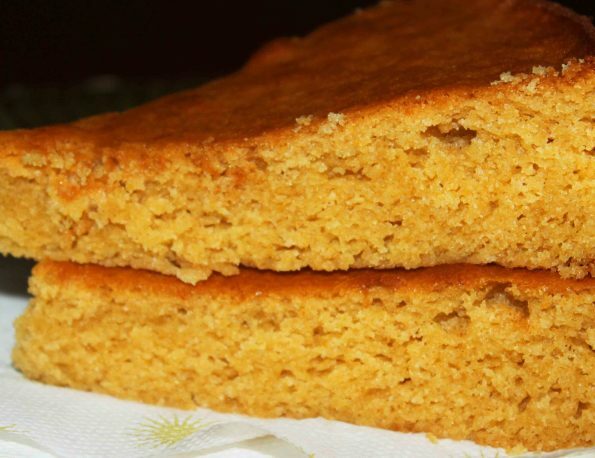 The cake is delicious and fluffy, and it has a slight natural golden yellow – orange color to it. If you wish, you can add your favorite flavors like vanilla essence or orange essence as you prefer, or try out new flavors. 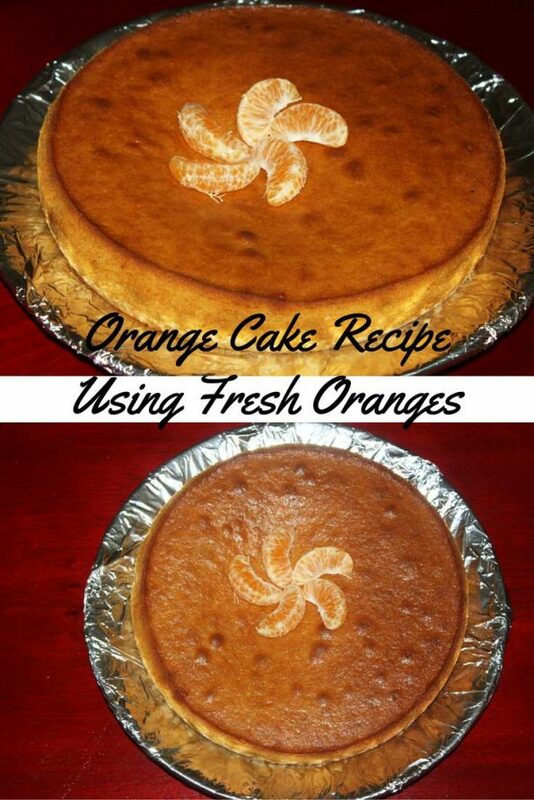 This is the basic recipe for a simple, delicious and egg less sweet cake prepared using orange juice. So here is how you can make homemade orange cake following the recipe for the simple eggless homemade orange cake recipe that makes 8 servings. 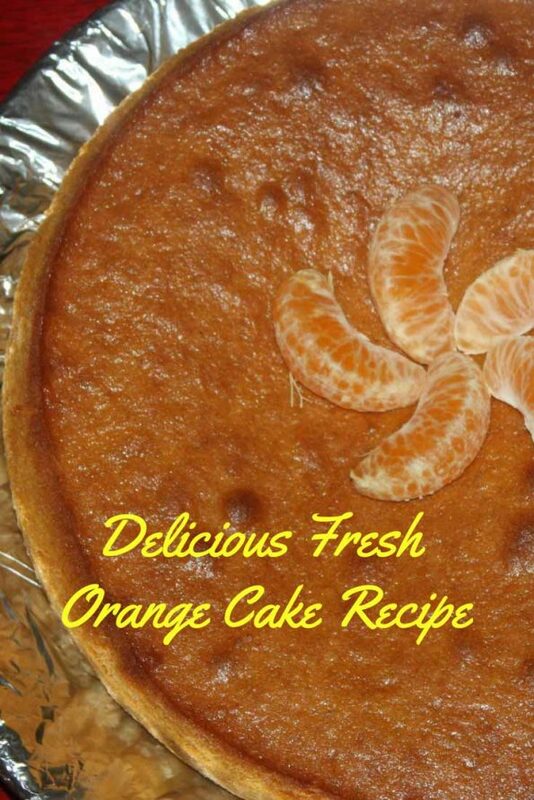 Easy, simple, delicious and fresh homemade orange cake recipe using fresh oranges. In a bowl, mix together the dry ingredients - flour, baking powder and baking soda. In another bowl, mix together the sweet condensed milk and also the melted butter. Take another bowl and stir together the orange juice and lemon juice. Also add the sugar to this, mix till it dissolves well. Slowly pour about half of the condensed milk - butter mixture to the flour and gently mix. Pour the remaining of the condensed milk - butter mixture to the flour and again stir well. Now add the juices to the batter and mix the cake batter very well till everything is combined nicely. Prepare the cake pan by greasing with little butter and pour the cake batter into it. Place the pan in the preheated oven and bake for about 20 to 25 minutes. My cake was done in 20 minutes, but you can make sure that by inserting a toothpick or knife in the center of the cake. If it comes out clean, the cake is done. Allow the cake to cool in the rack. Once it is cool enough, you can cut it and serve! 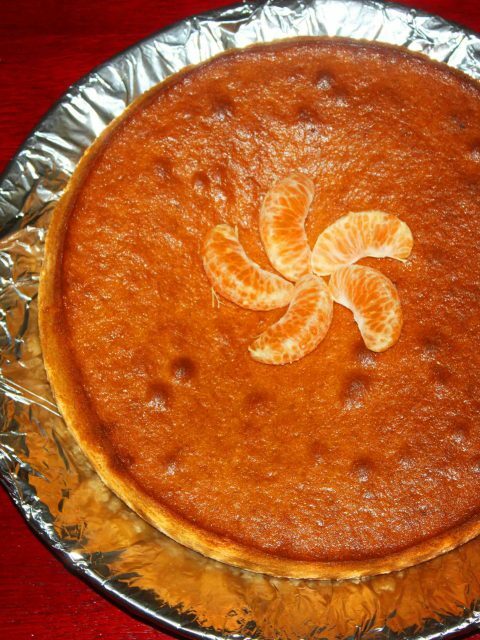 If you want more orange flavor for your cake, you may use few drops of pure orange extract too.